Shefali is using Smore newsletters to spread the word online. 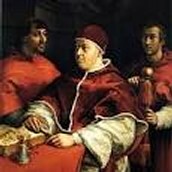 He joined the workshop of Perugino and was an apprentice to various artists in Italy and due to that his training was mostly about art. 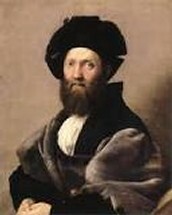 Raphael mostly created paintings and drawings. 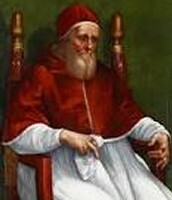 Though Raphael had many patrons his two most famous patrons were Pope Leo X and Pope Julius II, They were patrons to him in Rome. Humanism, Individualism, and Secularism were linked to Raphael in his 1509 School of Athens painting. Raphael's School of Athens depicts a number of Greek philosophers debating showed humanism. Raphael's School of Athens depicts the rising secularism in'the Renaissance also showed secularism. 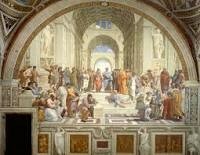 Raphael, while creating the School of Athens, depicted himself in the painting, like self glorification, showing individualism. Located in El Museo De Prado, this piece is one of Raphael's most brilliant paintings. The piece is beautiful, colorful and extremely detailed. The whole piece is like a drawing, each section of skin shows cracks that are not visible to the naked eye and each painted section of clothing is not just one color. 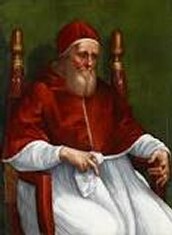 The oil and linen the piece was painted on shoes natural secularism. 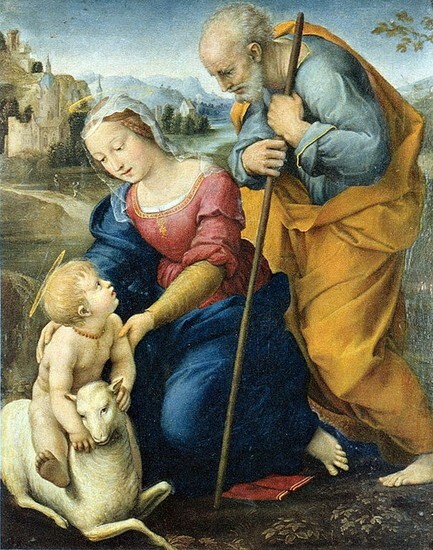 I chose this piece because it is different, it depicts a scene in my mind showing the emotion the holy family felt as the were with the lamb. The background is actually what caught my eye, it depicts a perfect day, it shows that the emotion felt is in the air. 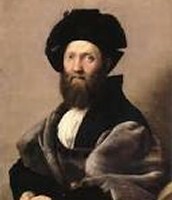 A picture might be seen of this piece in the private collection of Raphael's work.